Pastors Nathan Zakahi, Abner Solano, Juan Marenco, and Miguel Sanjuan have partnered to begin a Spanish language Bible institute in Sunnyside, Wash.
Hispanic Bible Institute equips Spanish-speaking pastors to preach the gospel. Nathan Zakahi, pastor of the Grace Brethren Church in Sunnyside, Wash., sat next to Juan Marenco, pastor of Iglesia de los Hermanos in Mabton, Wash., at the April 2010 conference of the Pacific Northwest District Fellowship of Grace Brethren Churches. The two began meeting weekly. Soon they invited two other Hispanic pastors, Abner Solano, church planter and pastor at Iglesia Vida Nueva, Grandview, Wash., and Miguel Sanjuan, pastor of Iglesia De Los Hermanos, Yakima, Wash., to join them. Even in the early days, Marenco could see the future success and suggested they take photographs to chronicle the beginning, according to the Sunnyside pastor. Now in its third year, the Bible Institute spans ten courses over three years—500 hours of total study. The curriculum includes classes such as Bible Study Methods and Rules of Interpretation; Old Testament Survey; New Testament Survey; Bible Doctrine Survey; Personal Spiritual Life; Church Ministry and Administration; Teaching Principles and Methods; and Missions, Evangelism, and Discipleship. At completion, certificates are issued through BTCP (Bible Training Center for Pastors). In May, it is expected that 11 students will comprise the first graduating class. The Institute’s goal is to train pastors specifically for the purpose of planting new Hispanic churches in the Yakima Valley, the fertile south-central region of Washington State, where Spanish-speaking residents make up approximately 80 percent of the population. Bible Institute student Edgar Arreola is working alongside Chris Carlile, who is planting an English-speaking church in Walla Walla. Edgar drives one and one-half hours each week to come to the classes in Sunnyside. While the classes are designed specifically to train pastors, the faculty encourages women to take some of the courses in order to gain leadership experience. 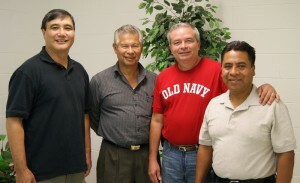 Currently, classes in the Institute are led by five professors: Marenco, Solano, Sanjuan, Simon Perez (described by Zakahi as a ‘stand-out student’ and older gentleman who is a general con- tractor), and Adrian Showalter, a Spanish-speaking member of the Yakima church who moved his family from Akron, Ohio, to be involved with the ministry. This article appeared in the Winter 2013 issue of GraceConnect, the magazine for the people of the Fellowship of Grace Brethren Churches. Click here to see the entire issue.